With our little lady soon making her debut, we really want to make sure that we don’t forget to make Lil’Man feel special also. I feel that we’ve been taking a ridiculously long time getting his room setup, but I’m hoping that the fact that he has all his favorite books and toys — Legos, trains, blocks — set up in our living room has helped. As it is, the room we chose for him started out quite… Boring. Beige. Blah. Bleak, even. 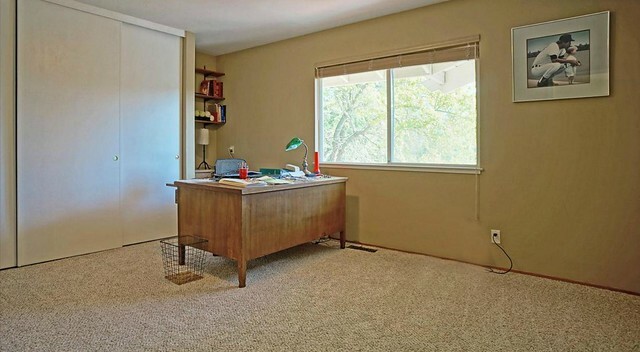 It’s hard to tell in this photo from the realtor listing, but the paint is dingy and that carpet is hideous. The sellers claimed the carpet was “new” but I swear it was last popular in the early 70′s. The first thing we did, before even moving in, was rip out that terrible, allergen-collecting shag from all the upstairs rooms (this room, the adjoining hall, the master suite and the nursery-to-be). 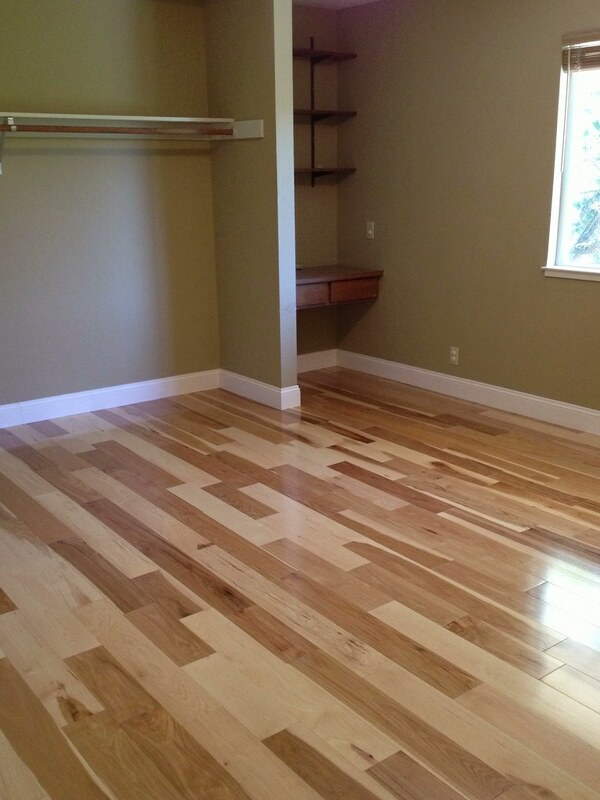 We chose a hickory that coordinated with the existing hardwood in the living/dining area. I never imagined I’d choose a flooring like that, but I kinda love it in this house. We also added nice, wide baseboards, replacing that plain, brown, quarter-round. 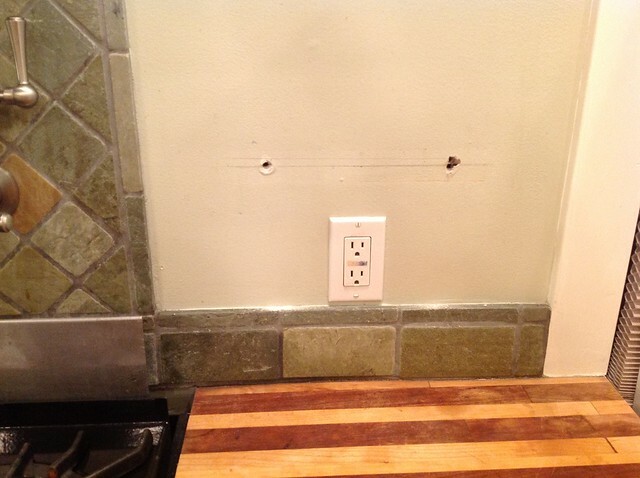 (The contractor tried to talk me out of the taller baseboard. He said it would make the room feel smaller, but I think he just didn’t want to deal with the wider and, therefore, stiffer boards. So glad I listened to my instincts!) Finally, we ripped out the closet doors. They were cheap plywood doors on noisy runners and I thought curtains would work fine. I want to make sure we encourage that creative mish-mash of characters in his room, so I decided that themes were out the window (I know some people really dislike them anyhow, but I’ve found them to be a good way of focusing my ideas and I try not to get TOO caught up in a theme, at any rate). I also didn’t want to limit the colors in his room too much. I wanted him to have a colorful room that would embrace his wide variety of interests without getting too…chaotic (he has to sleep in here, after all). 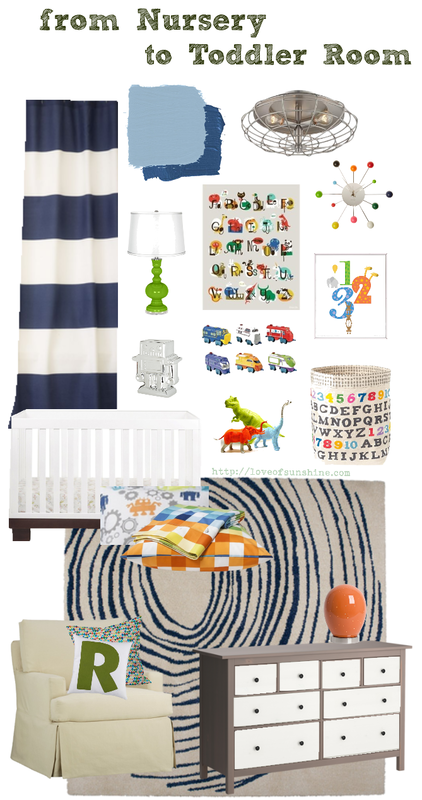 At the same time, I didn’t want to get rid of the big items we’d invested in for his nursery. As it was,the move meant that we had the opportunity to really make a room specific to him and I wanted to take advantage of that as much as possible. We still have the dresser and the rocker. The Mr converted his crib to a toddler bed when we moved. It might have been a bit early since he seemed happy enough to stay in his crib and hadn’t started climbing out yet. However, we thought that making the transition to the new house also be his transition to “big boy” room would go over well and we were right — he was pretty excited with it and adjusted very quickly. Even after all these months, he’s only gotten out of bed once in the middle of the night (and, even then, he cried for me to come get him at his doorway). A far cry from the terrible tan that dominated the room when we first saw it! I hope that the neutral furniture with the blues on the wall, the curtains and the rug will ground the room while still having a ton of color and fun in the rest of the decor. It really does feel more like it will match the boundless energy of a toddler, don’t you think? Since the painters finished last week, Lil’Man’s room is currently a lovely shade of blue. It makes a HUGE difference! When he came home after that first day, I told him to go look at his room. He excitedly ran in and jumped onto his bed in a flurry of wiggles and giggles. Then, he started petting the wall saying, “I love my blue walls!” It was adorable. We’ve done quite a bit more, but we still have to rearrange furniture and hang art, so you’ll just have to wait for the next update to see the next step in our toddler room’s (slow but steady) transformation! We’ve been in the house for a few months and I’ve been chomping at the bit to get some fresh paint up on our walls; the current paint feels so dingy and the walls have so many spackle patches. We have our colors pretty much picked out. We even have some brand new paint cans just waiting for us in our garage. Sadly, with our schedules lately, the impending holidays, and the fact that the Mr doesn’t want me and my ever-expanding belly climbing ladders and painting (even with no-VOC paints), it’s just not getting done. So, tomorrow we have a painting crew coming in to paint half the rooms in our house. I feel a little weird having someone else paint the rooms in our house (except for our entryway and staircase which are really high and I can’t imagine climbing up a ladder that tall to get them done. *shudder*). In all our past homes, we painted our own walls and it wasn’t that big a deal. In fact, I generally enjoy the satisfaction of watching a room transform. Having someone else paint feels like such an extravagance. That said, it’s also a little scary. It means trusting someone else to do exactly what you want done in your own house. And with this house, there’s so much! The former owners had attached a ton of cheap accessories to the walls in almost every room. I’ve already removed the (spider egg ridden) display shelves and curtains that they had over a couple of windows, the rusting iron towel holders in the kitchen and bathrooms, the brass sliding mirrored door tracks in our room, and the molding blinds that are hanging in the bathroom windows (which we NEVER use). I had my dad and the Mr rip out the closet door tracks, rod, desk and shelves in Lil’Man’s room. We still had a few things to do before the painters got here tomorrow and we figured it would be a quick job before we turned in tonight. I mean, how hard can it be to remove a few knife magnet strips that are held in with just 2 screws? 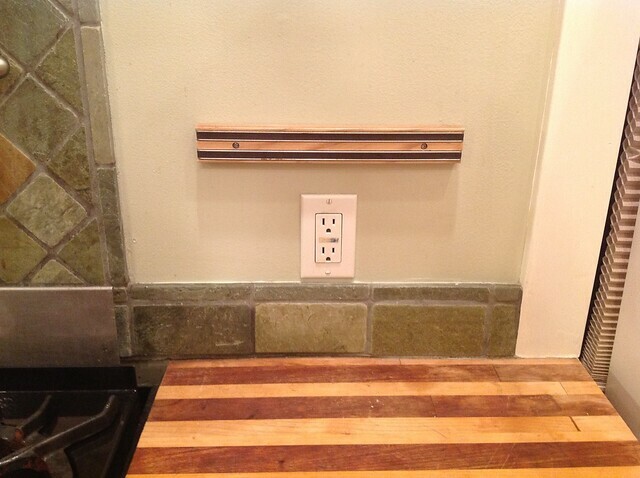 We have three of these in our kitchen and we never use them (we’re knife-block people), so we figured, we’d take them down so the painters would have a nice, clear wall to paint tomorrow. Easy, peasy, right? We were so, so wrong. The one in the photo above was the last one we removed and came out the quickest. Note the HUGE holes in the walls. They used anchors (even when they hit a stud) and alternated between 3″ Philips-head screws and 3″ Torx-head screws, most of which were stripped pretty badly. Three-inch screws are a pain to remove under normal circumstances. Three-inch screws in a stud AND an anchor with an unusual headtype‡ that are mostly stripped are nigh impossible to remove. It took us (and by “us”, I mean mainly the Mr) over an hour to remove all three and the other two strips were much more difficult to remove. 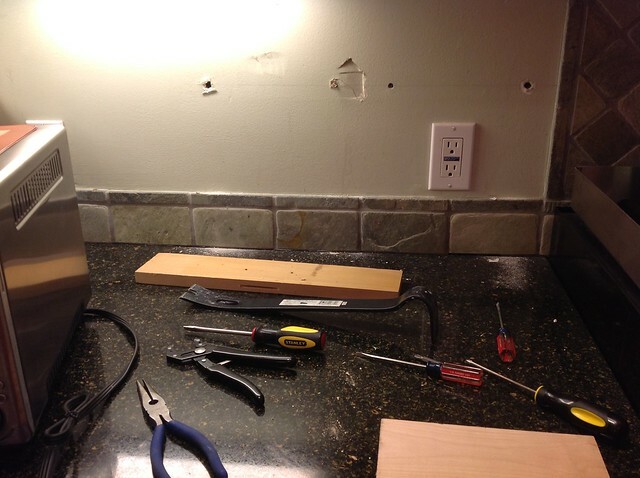 Yes, that is a crowbar on the counter. It was the only way that strip on the left was coming out (you can see the damage to the wall…the Mr felt awful about the dents, but it was the insane installation’s fault and totally not his). I’m not looking forward to removing the shelving in the laundry room. That was the other little thing I wanted to get done before tomorrow. I got 3/4 of the way done unscrewing the highest shelf before running into a bad screw. I’m pretty confident that the paint crew can get that removed for me if I ask nicely. However, there’s a chest-height, 1×4 strip of wood screwed and nailed into the wall with hooks randomly distributed along it’s length. It’s kind of painted onto the wall (they put on that red paint VERY thickly), but that’s a relatively small issue. I just know I’m going to have to take that crowbar to it because, while the screws came out easily enough, there seems to be about 30-40 nails just randomly hammered into the wood. I have NO idea why. They aren’t evenly spaced horizontally OR vertically. I’m not even sure they all go straight into the wall or if they go off at different angles. If the mag-strip experience is any indication, I’m in for quite the workout. ‡ Seriously. How many of you had to google the term “Torx screw” to know what kind of screw I was talking about? I was shocked that, not only did the Mr know what kind of screw it was, he had to tools to deal with it. Not that it mattered much, since they were so badly stripped. When we moved, we did all the usual things that movers have to do — send out cards to family and friends†, transfer utilities, update contact info with banks and credit cards, notify doctors and insurance companies, and forward our mail. Unfortunately for us, the previous owners haven’t bothered to do that last thing on that list. And possibly a few other things on that list. At least, we’re pretty sure they haven’t. Even after all this time, we’re still getting credit card statements, health insurance updates, even Social Security and tax refund checks! Of course, we’ve sent all these things back unopened and we’re slowly getting fewer and fewer of these mailings. The worst, though, has been the catalogs. Dear lord, THE CATALOGS! 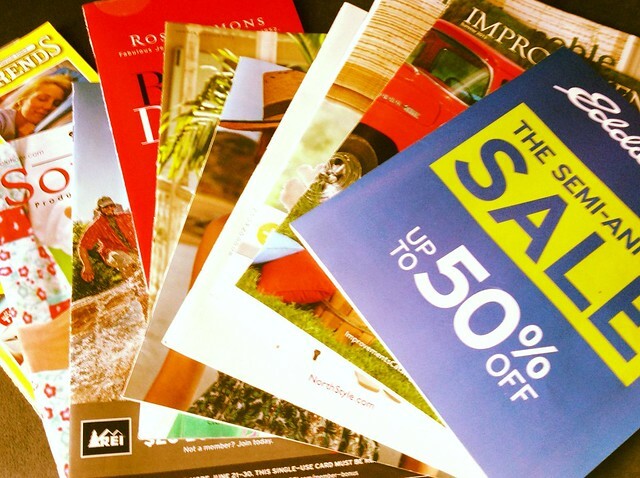 I personally loathe unsolicited catalogs. Just because I bought one item from your store or website doesn’t mean I want to get inundated with your entire store selection. Honestly, I’m not just saying that. However, the previous owners must have been serious catalog shoppers. Plus, they never cancelled any of the previous, previous owners’ catalogs either. Since we moved in, I’ve had to cancel over 150 subscriptions! There have been days where we could barely get the mail out of our mailbox, it was so tightly packed in (our mail-carrier is quite talented, it would seem). I was spending way too much time calling up companies, waiting for the next available customer service agent, and then spelling out my name, address and customer number for them. Then, of course, you still have to wait three months before being sure it worked (because they print their catalogs 2-3 months in advance). To streamline the process and help me keep track of what companies I’ve called about which addressee and customer number, I’ve been using Catalog Choice since early September. It’s been pretty great so far! We’re finally getting a bit less junk mail (we’re just now getting to the two-month mark since our first cancellations) and when we do get catalogs, I can lookup if I’ve already opted to cancel, so I’m not bothering AGAIN about something I’ve already dealt with. Even better, I can sit down at my computer and opt-out of 10 mailings in less time than it took me to call and cancel one via the phone. That’s a huge time savings for me! They don’t have every company available through this service, but they have most of the biggies and quite a few obscure companies. And if you can’t find a company you want to opt out from, you can always request they be contacted to join the list. So far, though, I’ve only found maybe 2 companies the site didn’t recognize, so their list is pretty impressive. Oh! and, for a feel-good factor, it keeps a tally of the estimated environmental impact you’re making. My understanding is that all the companies listed with Catalog Choice associate themselves with it voluntarily, and most of them have been extremely responsive with confirmation emails. Yet, some other companies make it hard to unsubscribe anyhow. Ethan Allen and Oriental Trading Company in particular have been a pain in my tuckus. They require you go to their website and fill out a whole different form, which wouldn’t be too bad except that they require WAY more information about you (why? I want you to leave me alone!) and sometimes move the URL of that form, so it’s not always up-to-date on Catalog Choice. Cuddledown is also annoying — I’ve cancelled a subscription with them three times: all the same name, but different customer numbers. Grrrrr… These companies have made me want to have nothing to do with them. Ever. Of course, I’ve been using the free aspect of this website. If you want to be even more aggressive about stopping unwanted mailings, they have a service called MailStop (which appears to be currently suspended for updates). I’m not sure how much they charge, but I’ve been quite happy with the free service so far, so I’m just sticking with that. Despite a few problematic outliers, the service seems to be working. I’m hoping that now that we’re getting into the new year, we’ll have significantly fewer catalogs to deal with. I’m so excited! Of course, we’re still getting fliers from realtors who want to help the former owners sell our house, but they have to give up eventually…don’t they? † Well, technically, we’re still in the process of sending out these, but we have done a few. 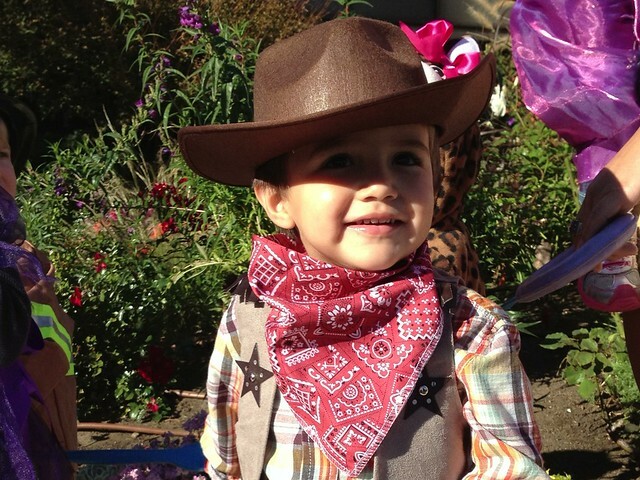 Our little cowboy enjoyed his first trick-or-treating experience. 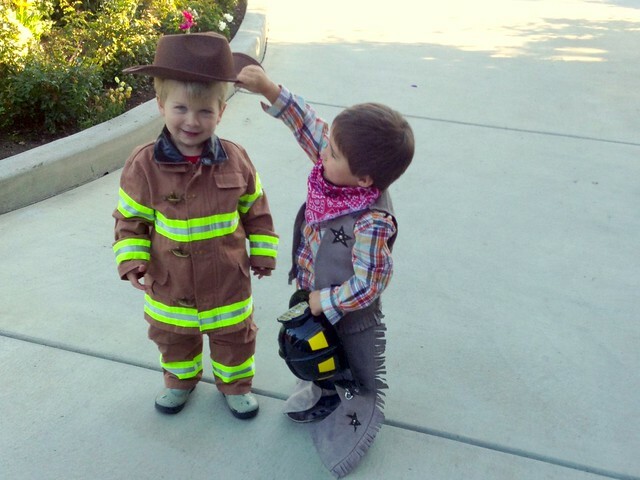 That people will give you chocolate for dressing up was a revelation for him. He also enjoyed mixing and matching with his bestie. Yeah, they’re adorable. Four months seems like a good long while, but I know that time will just fly by. 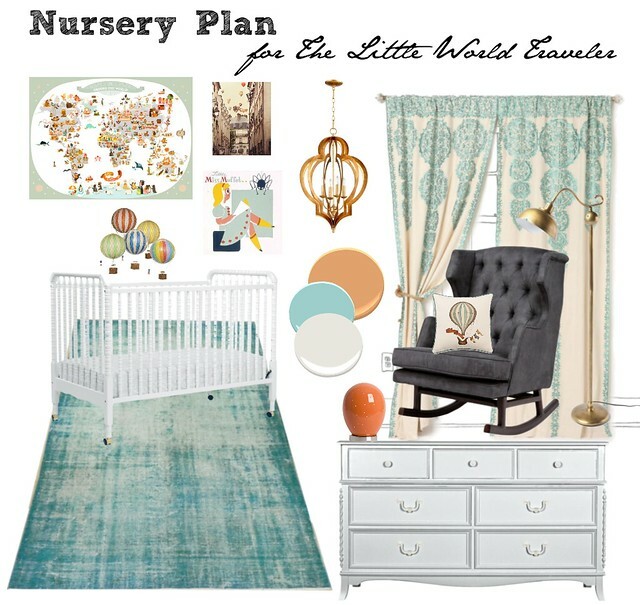 So…it feels like it’s time to start dreaming up a nursery for our baby-to-be. It never felt quite right for Lil’Man’s room (which had a circus vibe with a different color palette), but I still love it. It does feel right for a jumping off point for this new nursery. I really love the minty teal with the warm colors. 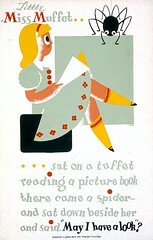 But I didn’t want a full-on nursery rhyme theme for my little girl. As much as I love nursery rhymes and fairy tales, I wasn’t feeling inspired by the idea. So, prompted by the poster’s reading theme, I thought of what books might be a fun jumping off point and Jules Verne’s 80 Days Around The World just grabbed me. I thought this could direct me to a “theme” without getting too “themey”. I could take ideas from as many different cultures as I wanted and match them with the feel of the book: photos of foreign cities, exotic textiles, maps, Victorian details… and hot air balloons. Can’t leave out the hot air balloons — that’s the most whimsical part of the book! So, when I saw this map on Apartment Therapy I had to look deeper. At first, I was disappointed with the mostly brown and sienna colorway, but then I looked at the designer’s website and ‘lo! A map that perfectly coordinated with my Miss Muffet print. In English (as opposed to French). It was kismet! I knew that this nursery was on its way. So far, this is what I’ve come up with. It’s definitely not pink, but it does, unequivocally, say girl (in, I hope, a very elegant way). And while I took elements of the book to direct my choices, I don’t think it screams “LOOK AT MY OH-SO CLEVER THEME!” This isn’t an exact plan for the room (lots of details to fill in! ), but it certainly has helped me hammer out some ideas. Plus, I’ve been able to show it to the Mr and get his stamp of approval. We have the framed art and the crib, but everything else is up in the air. For some items, I’m considering some DIY. For other items I’m really hoping I can find less expensive alternatives. Copyright © 2019 Love of Sunshine All rights reserved. Theme adapted from DeskMess by Laptop Geek.